The elimination of the world's illicit tobacco trade will not only save millions of lives but also generate billions of dollars in windfall for governments, the United Nations World Health Organization (WHO) announced today as it marked the 2015 edition of World No Tobacco Day. "On this World No Tobacco Day, I call for boosting the World Health Organization's Framework Convention on Tobacco Control to eradicate the illicit trade in cheaper tobacco products which tend to lure younger and poorer groups into addiction while depleting the ability of States to charge taxes that could support health services," Secretary-General Ban Ki-moon said in his remarks today. "By striking at the criminal gangs and tobacco companies that engage in this reprehensible trade, we will advance public health and sustainable development," he added. The Day – observed annually by the global community on 31 May to highlight the health risks associated with tobacco use and advocate for effective policies to reduce tobacco consumption – will this year see the WHO and the UN system as a whole urge Member States to sign the Protocol to Eliminate the Illicit Trade in Tobacco Products in order to improve public health, help cut crime, and curb an important revenue source for the tobacco industry. Nearly 80 per cent of the world's one billion smokers live in low- and middle-income countries, where the burden of tobacco-related illness and death is heaviest, according to WHO. The UN agency has further warned that tobacco, which caused 100 million deaths in the 20th century, may cause one billion deaths in the 21st century if current trends continue. Unless urgent action is taken, the annual death toll from tobacco consumption could rise to more than eight million by 2030. The Protocol, a supplementary treaty to the WHO Framework Convention on Tobacco Control, requires a wide range of measures relating to the tobacco supply chain, including the licensing of imports, exports and manufacture of tobacco products; the establishment of tracking and tracing systems and the imposition of penal sanctions on those responsible for illicit trade. It would also criminalise illicit production and cross border smuggling. “Public health is engaged in a pitched battle against a ruthless industry,” added Dr. Douglas Bettcher, Director of the WHO's Department for the Prevention of Noncommunicable Diseases. According to WHO eliminating the illicit trade in tobacco would generate an annual tax windfall of $31 billion for governments, improve public health, help cut crime and curb an important revenue source for the tobacco industry. The WHO Framework Convention on Tobacco Control entered into force in February 2005. Since then, it has become one of the most widely embraced treaties in the history of the United Nations with 180 Parties covering 90 per cent of the world's population. 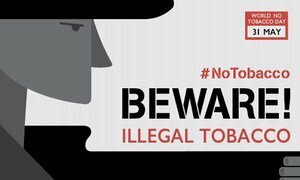 One in every 10 cigarettes consumed is illicit, making them cheaper and more accessible to people from low-income groups, as well as to children, the World Health Organization (WHO) has warned ahead of this year’s World No Tobacco Day, devoted to combatting the illegal tobacco trade.